Juvenile Idiopathic Arthritis (JIA): It Can't Stop Me! Regular physical activity can provide numerous benefits for kids with juvenile idiopathic arthritis (JIA). So, get out and get active! 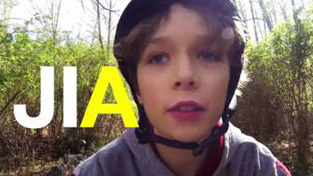 Watch the LEAP video, featuring active kids with JIA. In Canada, about 61,500 children live with arthritis. Juvenile idiopathic arthritis is the most common rheumatic disease in childhood. It is characterized by persistent inflammation in the joints that causes pain, stiffness and swelling. Effective treatments are available and children with arthritis can lead active lives. In fact, physical activity is important for children with arthritis. These children can develop weak muscles and low bone strength because of their condition and because they tend to be less physically active than children who don’t have arthritis. The Linking Exercise, Activity, and Pathophysiology in Childhood Arthritis: A Canadian Collaborative Team (LEAP) is a national research team funded by CIHR’s Institute of Musculoskeletal Health and Arthritis. LEAP is studying the link between physical activity and juvenile idiopathic arthritis. The LEAP study is the first research program to look at how active children with arthritis are at different levels of disease activity. It is also the first program to study bone and muscle development and biomarkers of inflammation in the blood. The work of the LEAP team will provide information to help us better understand the interaction between inflammation, physical activity, and bone development in children with arthritis. It will help develop safe and effective exercise programs to keep children with arthritis healthy and improve their quality of life. In the end, it’s about helping kids with arthritis be kids.